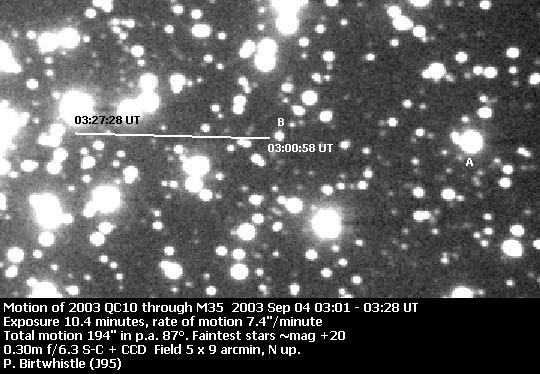 2003 QC10 was discovered by LINEAR on 2003 Aug 22 in Taurus, between the Pleiades and Hyades, travelling east. Two weeks later it had reached Gemini and passed through M35 on the morning of September 4th when the image above was obtained. Two days later it reached its closest to Earth (0.398 AU) and started to fade rapidly as it moved into morning twilight. The rich but small star cluster NGC 2158 is just out of field to the southwest. 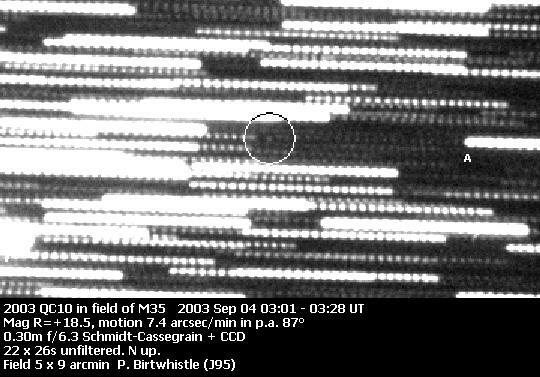 Because of the relatively fast motion of 2003 QC10 (7.4"/minute) exposures were limited to 26 second each to keep trailing of the asteroid to about 3". A total of 24 images were taken for stacking together to reveal the NEO. The rectangle in the main image above is enlarged below with the motion of 2003 QC10 marked. The last two images of the 24 taken could not be used as the asteroid had moved too close to the star just to the east of the track. Stacking the 22 usable images together to compensate for the asteroid's motion allows it to be detected as shown in the image below. The star field shown above can still be made out even though the stars are now long streaks. In particular, see the bright star marked A in both images and the star marked B in the image above. Between star A and B are a number of quite obvious background stars. The stacking process concentrates the asteroids brightness but spreads the stars light out, making them appear fainter. 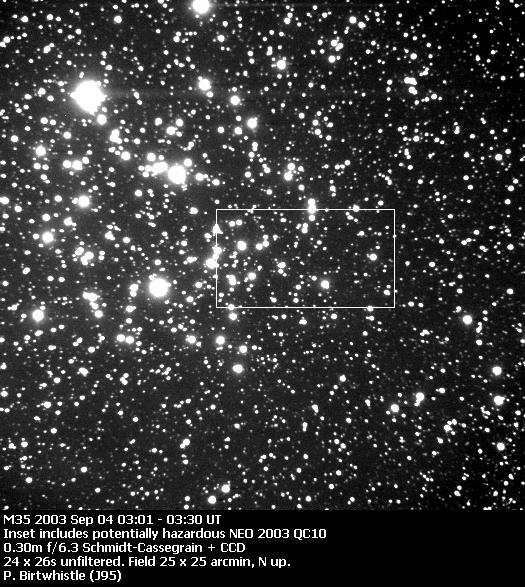 Note in the image below star B is visible as a very faint trail of dots extending from star A to within the circle marking 2003 QC10, each dot being fainter than the asteroid.